The buck no longer stops at the Treasurer’s Office. A more complex investment program, the need for more advisors, and a rising level of professionalism have all driven MIT’s endowment out of the Treasurer’s Office and into an entity called the MIT Investment Management Company (IMCo). Putting MIT more in line with common practice at other top universities, a chief investment officer will take charge of ensuring MIT’s long-term financial stability sometime next year. As federal research grants contribute an increasingly small portion of MIT’s operating revenue, the stability and growth of the endowment have become more important to MIT’s well-being. The success of the new Investment Management Company will be crucial to MIT’s future. In conjunction with the announcement of the retirement of Treasurer Allan S. Bufferd ’59, MIT has followed through on a long-term intention to split the financial responsibilities of the Treasurer into two new entities. The management of the endowment will shift into the MIT Investment Management Company, and the budget and other responsibilities will move to the executive vice president for finance and administration. The CIO, as the president of IMCo, will be responsible for managing the Institute’s nearly $11 billion in financial assets, including the endowment and pension plans. Bufferd said he does not anticipate the transition will impact Institute operations such as tuition or financial aid. Nor does he anticipate the IMCo significantly altering the Institute’s current investment strategies or portfolios. Because the endowment contributes more than $300 million per year to Institute operations out of a total operating budget of $1.8 billion, slips in performance have a wide-ranging impact, Bufferd said. The Institute’s endowment has languished in recent years, slipping 4.2 percent in 2003 because of poor investment performance in a weak market. This caused a budget crunch the same year, which prompted the Institute to close over winter break, lay off 250 MIT employees, and implement salary freezes. Bufferd said that IMCo is MIT’s response to three trends: a more complex and diverse investment environment, a limited pool from which to hire advisors and board members, and increasing the level of professionalism. While MIT’s investments 30 years ago were nearly all domestic stocks, bonds, real estate, and other traditional financial instruments, he said about two thirds of MIT’s investment activities today involve foreign stocks and bonds, venture capital, hedge funds, and other complex financial holdings. Bufferd said that IMCo would open the door for a greater portion of the “MIT family” to participate in the Institute’s investments activities than the pool of approximately 75 MIT Corporation members. Bufferd emphasized that while IMCo will be “a structure to focus on new issues” it will remain “a creature of MIT. It’s completely controlled by MIT.” In addition to the CIO acting as the president of IMCo, the Executive Committee of the MIT Corporation must approve the members appointed to IMCo’s board and its bylaws, and requires that MIT Corporation members must occupy a majority of the IMCo board. 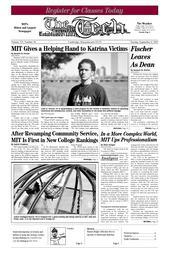 MIT is not unique in establishing an entity solely devoted towards the school’s investment activities. Bufferd said schools like Harvard, Princeton, Stanford, and the University of Texas all have equivalents to the IMCo. However, some investment entities at other universities have come under intense scrutiny from both members of the faculty and alumni associations. Both Harvard and Yale have come under fire in recent years for their investment practices. Harvard was criticized for awarding millions in bonuses to its top investment managers; the university defended its action by highlighting the large returns on the endowment at a time when other universities’ finances were struggling. Yale University’s endowment policies were criticized in 2002 over a conflict of interest between its forest preservation initiatives and possible logging on property owned by one of its subsidiaries. Bufferd said that the IMCo’s functions, while similar to other university’s investment practices, differ from those at Harvard and elsewhere. The staff of IMCo will formulate portfolio policy and strategy, which must then be approved by the all-volunteer board. Once approved, they will be implemented by outside managers. No member of IMCo would receive the seven or eight-figure bonus compensation like the Harvard managers, Bufferd said. MIT’s current network of outside investment managers includes more than 145 different relationships, the largest and oldest of which is with Wellington Management Company, Bufferd said. Investment managers generally retain a portion of the gains made on the investment as incentive compensation, rather than being directly compensated by the investment owners like MIT.